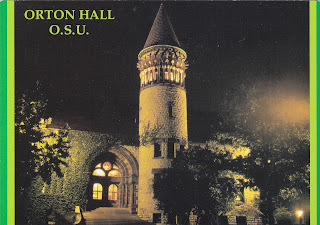 Postcard US-3620809 to China shows Orton Hall, one of the oldest remaining buildings on Ohio State University campus. Opened in 1893, it was named after Dr Edward Orton, Sr. who served as OSU's first president, Professor of Geology from 1873 to 1899, and Ohio's State Geologist from 1882 until his death in 1899. According to Wikipedia, the Hall is built of forty different Ohio building stones. In the outside walls, these stones are laid in stratigraphic order according to their relative positions in Ohio's bedrock. The capitals of the numbered columns in the entrance hall feature carvings of fossils, such as trilobites, as well as other objects such as the races of Man. The bell tower was dedicated in 1915 and contains 25,000 pounds of bells that can be heard regularly tolling across campus in the key of E-flat. Encircling the top of the tower are 24 columns with gargoyle-like figures which are restorations of fossil animals. Orton Hall was placed into the National Register of Historic Places on July 16, 1970, along with University Hall and Hayes Hall. It presently hosts the School of Earth Science, laboratories of Paleontology, Historical Geology and Sedimentology, the Orton Geological Museum, and the Orton Geological Library.